Born in the Echoes is the eighth album by English electronic music duo The Chemical Brothers, released on 17 July 2015 by Astralwerks in the United States and by Virgin EMI Records in the United Kingdom. It was their first studio album since 2010's Further. The album debuted at number 1 on the UK Albums Chart, marking the duo's sixth chart topper and making them the dance act with the most number-one albums ever in the UK. The album's first single, "Sometimes I Feel So Deserted" with Vocals by Daniel Pearce, was released on 21 April 2015. The second single, "Go", was released on 5 May. "Under Neon Lights" was released as the third single on 23 June 2015, and features St. Vincent, credited by her real name (Annie Clark) on vocals. The performance of "Go" in the charts propelled The Chemical Brothers back into the mainstream, with DJs such as Annie Mac including it on their playlists of the year. However, some critics believe it was "poppy", and not keeping to their roots. Despite this, the remainder of the album was well received, drawing particular attention to the 1990s sound of singles such as "I'll see you there" and "Taste of Honey". Overall, it proved a moderate commercial success whilst maintaining enough of its distinctly "big beat" sound that gave it such success with albums such as "Dig Your Own Hole" and "Exit Planet Dust". 1. "Sometimes I Feel So Deserted (Vocals by Daniel Pearce)"
5. "I'll See You There"
9. "Born in the Echoes"
12. "Let Us Build a City"
"Sometimes I Feel So Deserted" contains an interpolation of "Brighter Days" (1997) by Big Moses featuring Kenny Bobien, with re-recorded vocals by Daniel Pearce. As with all other albums by The Chemical Brothers, some of the tracks segue into the next. These are 3 into 4, and 4 into 5. Beck – vocals on "Wide Open"
Cate Le Bon – vocals on "Born in the Echoes"
Annie Clark – vocals on "Under Neon Lights"
Ali Love – vocals on "EML Ritual"
Q-Tip – vocals on "Go"
↑ "Sometimes I Feel So Deserted". Qobuz. ↑ "Under Neon Lights". Qobuz. ↑ "Reviews for Born In The Echoes by The Chemical Brothers - Metacritic". Metacritic. ↑ David Jeffries. "Born in the Echoes - The Chemical Brothers". AllMusic. ↑ "The Chemical Brothers – Born in the Echoes - Album Reviews - Consequence of Sound". Consequence of Sound. ↑ "The Chemical Brothers". Pitchfork. ↑ "The Chemical Brothers' New Album: Born in the Echoes". Rolling Stone. ↑ Ben Cardew (7 July 2015). "The Chemical Brothers - 'Born in the Echoes'". NME. ↑ "The Chemical Brothers: Born in the Echoes (Astralwerks) Review - Under the Radar - Music Magazine". undertheradarmag.com. ↑ "The Chemical Brothers". MOJO. ↑ Neil McCormick (11 July 2015). "The Chemical Brothers, Born in the Echoes, review: 'sci-fi gleam'". Telegraph.co.uk. ↑ "The Chemical Brothers, Born in Echoes - album review: A timely contrast to the bland EDM of Calvin Harris and David Guetta". The Independent. ↑ "Sometimes I Feel So Deserted | The Chemical Brothers – Télécharger et écouter l'album". Qobuz.com. Retrieved 2015-06-13. ↑ "Go | The Chemical Brothers – Télécharger et écouter l'album". Qobuz.com. Retrieved 2015-06-13. ↑ "The Chemical Brothers Official Store". Store.thechemicalbrothers.com. Retrieved 2015-07-17. ↑ "Official Singles Chart Top 100 | Official Charts Company". www.officialcharts.com. Retrieved 2016-01-27. 1 2 Empire, Kitty (2015-07-26). "Chemical Brothers: Born in the Echoes review – a victorious racket". The Guardian. ISSN 0261-3077. Retrieved 2016-01-27. ↑ Eakin, Marah (22 June 2015). "Turn On, Tune In, Watch the Video of St. Vincent's Song for the Chemical Brothers". The A. V. Club. 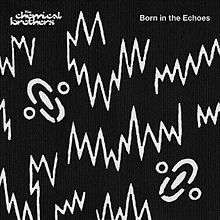 ↑ "Australiancharts.com – The Chemical Brothers – Born in the Echoes". Hung Medien. Retrieved 25 July 2015. ↑ "Austriancharts.at – The Chemical Brothers – Born in the Echoes" (in German). Hung Medien. Retrieved 29 July 2015. ↑ "Ultratop.be – The Chemical Brothers – Born in the Echoes" (in Dutch). Hung Medien. Retrieved 24 July 2015. ↑ "Ultratop.be – The Chemical Brothers – Born in the Echoes" (in French). Hung Medien. Retrieved 24 July 2015. ↑ "Dutchcharts.nl – The Chemical Brothers – Born in the Echoes" (in Dutch). Hung Medien. Retrieved 24 July 2015. ↑ "Lescharts.com – The Chemical Brothers – Born in the Echoes". Hung Medien. Retrieved 27 July 2015. ↑ "Longplay-Chartverfolgung at Musicline" (in German). Musicline.de. Phononet GmbH. Retrieved 24 July 2015. ↑ "Italiancharts.com – The Chemical Brothers – Born in the Echoes". Hung Medien. Retrieved 25 July 2015. ↑ "GFK Chart-Track Albums: Week 31, 2015". Chart-Track. IRMA. Retrieved 31 July 2015. ↑ "NZ Top 40 Albums Chart". Recorded Music NZ. 27 July 2015. Retrieved 24 July 2015. ↑ "Oficjalna lista sprzedaży :: OLIS - Official Retail Sales Chart". OLiS. Polish Society of the Phonographic Industry. Retrieved 31 July 2015. ↑ "Spanishcharts.com – The Chemical Brothers – Born in the Echoes". Hung Medien. Retrieved 29 July 2015. ↑ "Swisscharts.com – The Chemical Brothers – Born in the Echoes". Hung Medien. Retrieved 29 July 2015. ↑ "Official Albums Chart Top 100". Official Charts Company. Retrieved 31 July 2015. ↑ "The Chemical Brothers – Chart history" Billboard 200 for The Chemical Brothers. Retrieved 28 July 2015.